Matsui’s works, undoubtably deliver a sense of pain and horror to the viewer. 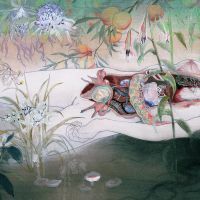 An artist highly skilled in nihonga (Japanese painting) techniques, she sets herself apart from others in the genre with her unsettling subject matter. 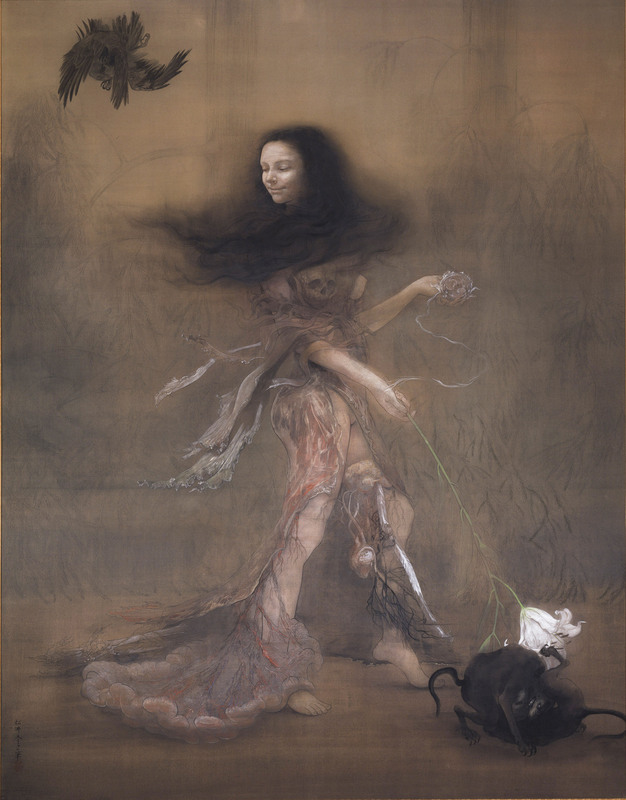 Eerie images of female yūrei (ghosts of vengeful souls) and supernatural dissections are frequently found throughout Matsui’s first major solo exhibition, which covers the initial 10 years of her career. Matsui, however, says she wants her audience to experience more than just chills. There is also hope. The exhibition’s title, “Becoming Friends with All the Children in the World”, is taken from a major work Matsui completed as her graduation piece at Tokyo University of the Arts. Such an adorable title seems more appropriate for a children’s book. As it turns out, the title was inspired by a strong concept Matsui had as a child, a time when the hyperbolic idea seemed entirely possible to her. “I think it’s a combination of hope and madness,” she explains. 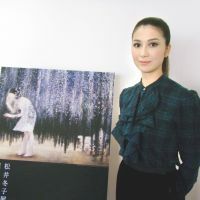 This combination of good and bad emotions may seem strange, especially to a Western audience, but Matsui regards it as essential to the success of her art. It is why discussions of pain and horror go hand-in-hand with finding a renewed sense of being alive. At the time of this interview, Matsui was in the middle of producing an upcoming short video — the first time she has worked in the medium. “It’s fun to come up with the ideas but it’s also hard work because so many people are involved in this project, such as those controlling the film studio, sound, visual effects, etc.,” she says. However, Matsui’s thoughts on the feminist aspects of her past work are foremost in her mind. In this exhibition, on display for the first time are five works from a series Matsui is producing based on a Buddhist sutra called the “Nine Stages of Decay,” referred to in Japanese as “kusōzu.” The depiction of kusōzu in Japanese art has, since medieval times, always used a female body as its subject. In her own paintings, Matsui has occasionally made direct references to the “Kusōzukan”, a scroll made in the Kamakura Period (1192-1333) and now held at the Kyushu National Museum. “I did get inspiration from kusōzu, but I don’t agree with the Buddhist way of thinking,” explains the artist. “I think the kusōzu was originally used to teach men that even beautiful women can decay, so they should give up such carnal desires. This way of thinking is very male-centered and I feel an aversion to it. Like many artists, after the Great East Japan Earthquake, Matsui’s initial reaction was prolonged shock and inaction. However, by the middle of the year, she was producing new works, some of which were auctioned off with all the profits going to Tohoku relief projects. Among the three uchiwa fans from the auction chosen for this exhibition, one has an obvious connection with the Tohoku region’s recent history. “The Lone Pine of Rikuzentakata” (2011) is an ink painting of one of Iwate Prefecture’s most famous symbols of hope and recovery. Those events appear to have affected Matsui’s art on a deep level. Although the pain has been great for those who lost loved ones and their homes, she appreciates the fact that more people in Japanese society today have expressed a deeper sense of empathy and seem evermore thankful to be alive. The newest piece in the show, presented in the very last room of the exhibition, is “Born” (2011). Depicting a dragonfly undergoing metamorphosis, this work could mark a new focus in her art. 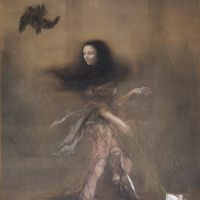 In fact, this 10-year retrospective seems to be giving the artist a new perspective on her art-making altogether, revealing a shift in Matsui’s emphasis on death to an emphasis on life, and the essential balance between them. “Fuyuko Matsui: Becoming Friends with All the Children in the World” at the Yohohama Museum of Art runs till March 18; admission ¥1,100; open 10 a.m.-6 p.m., closed Thu. For more information, visit www.yaf.or.jp/yma.